The number of anti-Muslim groups in the US nearly tripled from 34 in 2015 to 101 last year, according to an annual census of hate and anti-foreigner groups compiled by the Southern Poverty Law Center (SPLC), a leading hate crime monitor. In a report published on Wednesday, the SPLC said Donald Trump’s successful campaign for the US presidency had energised the “radical right” and contributed to an overall net increase in the number of hate groups from 892 in 2015 to 917. “2016 was an unprecedented year for hate,” said Mark Potok, senior fellow and editor of the SPLC’s Intelligence Report magazine, highlighting the rise to influence of “white nationalist” activists such as Steve Bannon, Trump’s chief strategist who formerly edited the far-right Breitbart News website. Young white men are being radicalised. It’s time to talk about it. The SPLC said the overall number of hate groups likely understated the real level of organised hate in the US, as growing numbers of extremists were operating online and not formally affiliated with hate groups. But it did record a fall in the number of organised anti-government armed militia groups, which it suggested may be due to the mainstreaming of far-right political ideas and ideologies previously confined to the political fringes. The report said that the dramatic increase in groups with a specific anti-Muslim agenda had been “fuelled by Trump’s incendiary rhetoric, including his campaign pledge to bar Muslims from entering the United States, as well as anger over terrorist attacks such as the June massacre of 49 people at a gay nightclub in Orlando”. The magazine highlighted details of an alleged plot by three members of a group called the Kansas Security Force to blow up an apartment building housing more than 100 Somali-born Muslim immigrants and a mosque which was reported to have been planned for the day after last November’s election. The SPLC said that the growth had also been accompanied by an increase in hate crimes targeting Muslims. In a report in November, the SPLC said that nearly 900 incidents of hate and intolerance were recorded across the US in the days following Trump’s election. It also cited an arson attack on a mosque in Victoria, Texas, just hours after Trump’s inauguration last month. Trump’s presidency has sparked a wave of protests by civil liberties campaigners, with many taking to the streets to protest on the day of his inauguration and subsequently in opposition to a temporary ban on travellers from seven Muslim-majority countries entering the US. 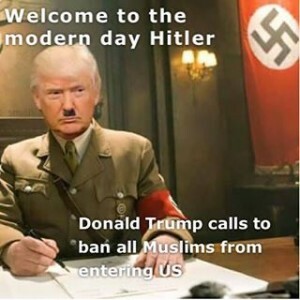 Fallout from Donald Trump’s Anti-Muslim Campaign & Rants in the US? Fallout from Donald Trump’s Anti-Muslim Campaign in the US? Translated from Urdu by Fauzia Iqbal. Edited by Victoria Branca. Nearly 200 Muslim employees were removed from their jobs for offering Friday prayers in the American state of Colorado. According to U.S. media, the administration of a meat processing factory took this step upon learning that factory workers had gone to offer Friday prayers. The workers — from Somalia and other countries — who had gone to offer Friday prayers, were prevented from re-entering the factory. It appears that the hate-rousing campaign against Muslims launched by U.S. presidential candidate, Donald Trump, is starting to show its effects now. Muslims residing in different places throughout the U.S. all offer Friday prayers and, in most places, are facilitated in this by the government and the police. So much so, that even double parking is allowed outside mosques at the time of Friday prayers — something that is generally never allowed. This suggests that the factory owner’s orders were given on account of some current provocation. It is possible that he is a supporter of Trump. Knowing it is unlikely that Trump will become president, he sought to punish Muslims for offering Friday prayers as a means of implementing Trump’s anti-Muslim views. Praying at prescribed times is binding on Muslims and the blessed Friday prayers have to be offered in a mosque. These Muslims sacrificed their jobs for the sake of their religious duties. Now Muslims must unite to prepare some framework for dealing with the situation.